Excuse me, hi. Yes, is this thing on? Yes. Hi. I think we should talk about something. Caramelized onions. Can we just agree right now that they smell of heaven above and bring happiness, justice and tranquility wherever they go? Well. I made that stuff up about justice and tranquility. But the happiness part, and also the heaven scented bit, those are true. Empirically and emphatically true. The smell of onions caramelizing in a pan, that powerfully sweet yet grounding smell, the one that fills kitchens and minds with hints of something good to come — is there any smell much better than that? New babies, maybe. Or unicorns. I guess. These particular onions, those ones right up there, ended up in a frittata. A caramelized onion frittata with feta cheese and herbs. Frittatas, for those of you who are curious (or perhaps tend to skip brunch), is sort of the Italian version of an omelet. Made with eggs and usually some kind of vegetable or meat (frittatas are prime real estate for leftover meat and veggies), frittatas are different than omelets in that they’re cooked through in the oven, instead of on top of the stove, and they’re often served at room temperature, sliced into wedges or squares. An easy dish to throw together and one that takes well to being prepared ahead of time, the frittata is like a pocket Ace for a thankful kid on Mother’s Day. Keep this one up your sleeve. Some frittatas are made in a skillet (cast-iron works beautifully), started on the stove top and finished in the oven, but I poured my eggs right into a nonstick square brownie pan and baked it entirely in the oven. It came out beautifully – slightly blistered and crispy on top, soft and smooth inside. Coat the bottom of a medium large skillet with olive oil over medium heat, and add the butter. Once the butter has melted, add the sliced onions, and stir to coat with fat. Once the onions are coated and beginning to look translucent, season them with a pinch of salt and pepper, and turn the heat down to low. Cook the onions slowly, over low heat, stirring occasionally, until they begin to turn brown, or caramelize, about 30 minutes. Don’t rush the onions. It takes time for their natural sugars to come out and develop that deep, sweet flavor. 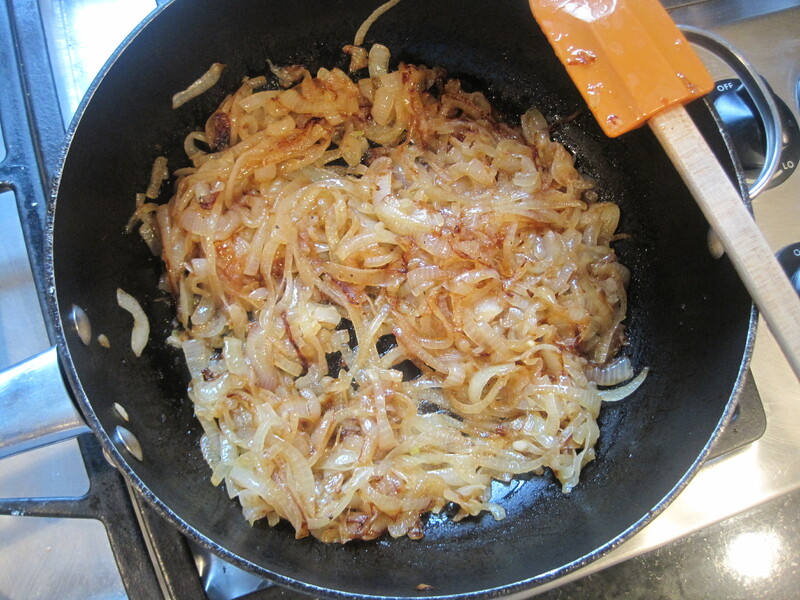 Once the onions have caramelized, remove them from the heat and let them cool to room temperature. Once cooled, arrange the onions in an even layer at the bottom of an 8-inch square brownie pan (if the pan is NOT non-stick, be sure to coat the bottom and sides with butter or cooking spray). Crack the eggs into a bowl and whisk them vigorously, at least 30 seconds. Season them with salt and pepper, and add the milk or cream, shredded cheddar cheese and herbs, mixing well to combine. Pour the egg mixture on top of the caramelized onions, and top with the feta cheese (and one more sprinkling of herbs, if you’re so inclined). Bake the frittata in the oven at 400ºF for 20 – 30 minutes, or until the top has browned slightly and the center is just slightly jiggly when you shake the pan. Let the frittata cool before cutting into squares for serving. 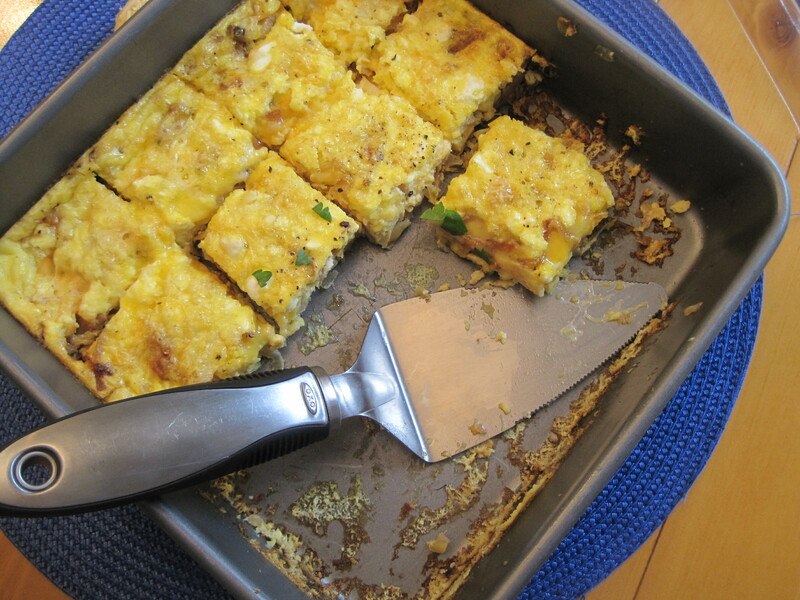 Makes 16 small frittata squares, or 9 large ones. i KNOW how good this is!!!! I'm obsessed with your fritattas, chef molly1!!!! I’m making this right now! Will keep you posted on the results!